Last night, I blasted my very favorite pump-up songs and danced around the kitchen while belting into a giant metal spoon. Nothing especially exciting had occurred to affect my mood. I just felt joyous. Exuberant, even. 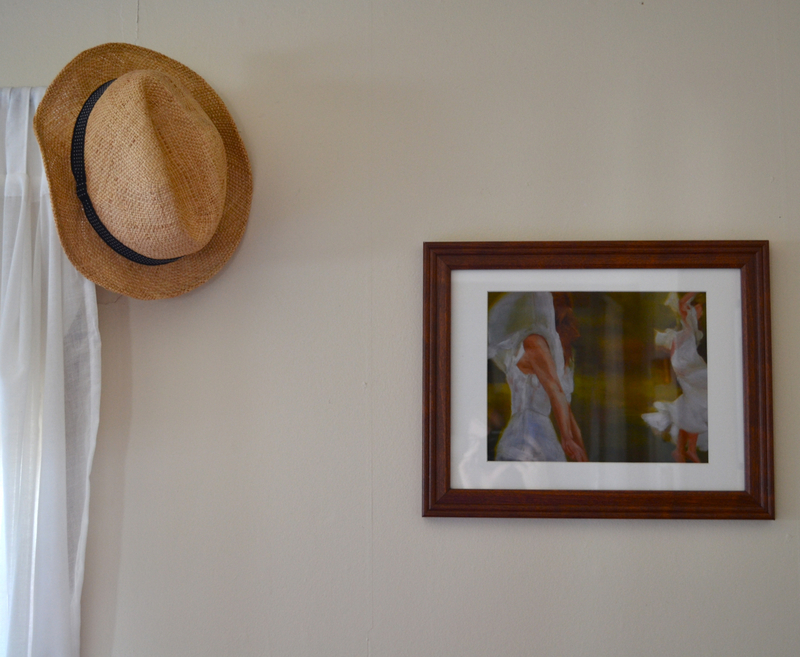 The topmost image is a newly-framed art print hanging in the bedroom. I bought it from the shop of one of my dear blogging friends, artist and film-maker, Kimia Kline. It makes me happy. I snapped the second photo when I was slicing fruit for breakfast earlier this week. 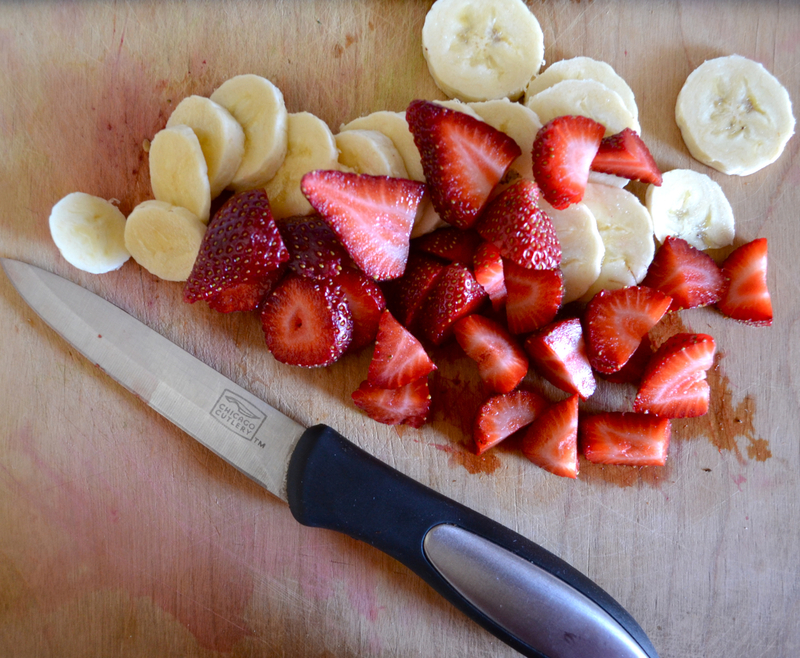 The fruit was pretty, but it was the pink stain it left on the cutting board that caught my eye. I've been thinking a lot about little moments such as these, and how significant they can be. Sort of like this nugget of wisdom I read on Twitter the other day: "Nothing wrong with loving the crap out of everything. Never apologize for your enthusiasm." (Thanks, Ryan Adams). Sometimes I need to remind myself that happiness doesn't need to be justified. P.S. My pump-up songs of choice, in case you were wondering: One, Two, Three, Four. (And no, I won't ever apologize for loving the hits, either). Haha... love this story and your pump-up songs (and that you shared them)! : ) This whole post together makes an image of you dancing, dressed like the woman in painting, cutting fresh fruits in the kitchen. btw - fruit looks delish - off to check out that shop and the music! I love that you were singing into a spoon in your kitchen those really are the best moments of all. I have to agree nothing wrong with loving the crap out of everything!! Those silly singing-into-the-spoon moments are the best. They make life memorable. We should never apologize for our enthusiasm or joy in life. I say, turn that music up and dance! I was kind of doing the same thing last night with my iPod on. It makes chore more fun =) Love the picture! love it! you are the cutest. Beautiful thoughts for today. Thank you! Em, I completely agree. Tiho doesn't know what hit him when I make dinner (he usually handles dinner around here). When I do it, wine, fancy plates and mood music usually make an appearance. This is perfect, as are your pump up songs, and Kimia's piece in your bedroom! I got a giggle at your breakfast-that's my go-to meal before morning auditions, because the beta blocking banana helps nerves! Apparently we even eat alike! UMMM. best post ever? Maybe? You totally just made my day. The print just looks like it belongs there. :) Thank you for all the love my dear. It is totally reciprocated. hooray for dance parties of one :-) although his name is beyond absurd, i can't help but love that flo rida song! What a wonderful post! I can totally see you, dancing around your kitchen, belting out the tunes into your wooden spoon/microphone... Love those moments of pure joy! I say relish them. I agree, those moments are some of the best in life - a good sign that you're present enough to notice the pink!